Wow, how much do you play the piano? Not sure what my arrangements say about my piano playing, but I used to play loads. I was really into classical piano but I eventually got burned out because it was very difficult and I found the performances were too stressful. Nowadays I'm more into singing but I still enjoy playing the piano in a more casual way. I noticed that in a few of your sheets, you tend to hide some rests that would be better visible imo and some of the text isn't aligned properly. A lot of my feedback is kind of picky but in general nice work! Wow, that's a lot of feedback. Thank you for taking the time to look through my sheets. I've fixed some things regarding this but at the moment this sheet isn't really a priority for me. I'll probably go back to it properly at some point, but since it's so short I won't want to waste a submission with it. Thanks for looking at it anyway; I'll use your criticism when I go back to it later. 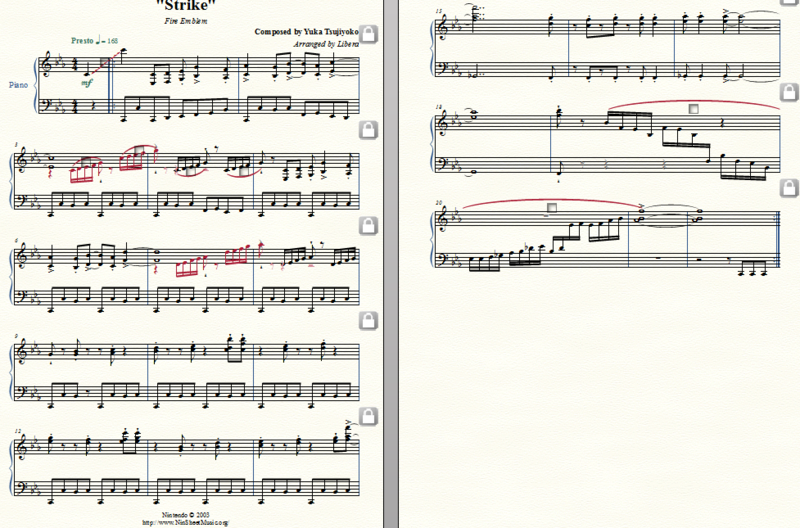 -I used cross-staving if it's only for a beat since a clef change seems silly to me there. I prefer clef changes to cross-staving generally though so I've kept those in. -Everything else has been changed. -I think I've fixed the opening beat now. -I find hearing inner voices in chords pretty hard, so thanks for the help on that. I've added them now. -In m.10 beat 2 it is definitely two semiquavers. I fixed the rest of the notes (I have no idea how I got them so wrong). -I have no idea what you mean about m.15. -Most of my slurs are actually phrase markings. I guess that's something people don't really do on here since someone has brought me up on it before. -Everything here has been changed. Once again, thanks for taking the time to look through these! So like, I felt like there were a lot of other problems that could have been solved by just moving things around. Pedal markings are your friend if you know how to use them effectively, and cross staffing a section doesn't have too look as complicated as it does. Remember, you're arranging for the best possible visual sheet for someone to feel like they can look at it once and play it. Sometimes, tho, Finale doesn't like to make it sound that way, and has to be jerked into making it sound the way we want because the midi is so awful sometimes. I get that. Anyways, here's a few solutions for Safeguard sheet. 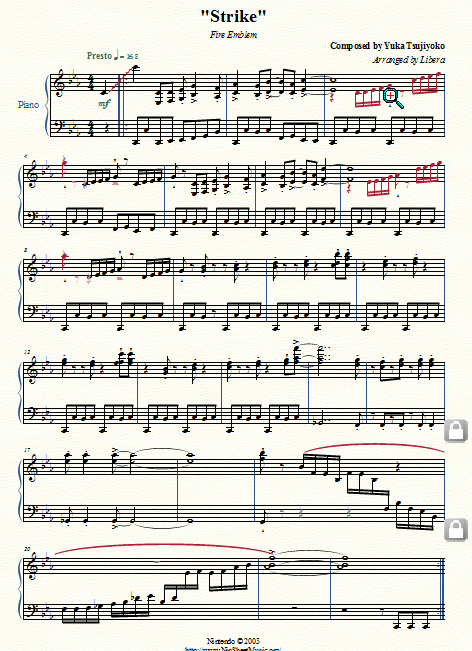 The first four 8 measures not including the pickup measure, some of the clef changes are a little cluttering. Particularly, measure 3. Unless you're moving ranges constantly like moving from one side of the piano to the other, you can do what I did here. 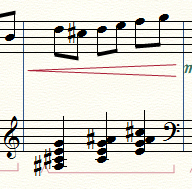 Cut off a part o the attached eighth notes and then change clef. That way the phrase is essentially finished before your eyes take in more, new information. Same with the clef change in measure 5. I just moved it back with the measure so it doesn't seem too unexpected. Pretty much the same from measure 9 on out. I just used the cross-staff tool as efficiently as possible and got rid of all of the unnecessary clef changes. I'm not sure what the notepad version of finale allows when it comes to manipulating slur handles, but the changes done are relatively quick and easy. Measure 7 and 8 are interesting because I used the a manual pedal marking there. In the original, you have the note sustained with a clef change in the upper part, when you could rewrite it as so and still get the same effect. I feel it's not that big of a deal since isn't the ONLY place where that happens. The midi may not sound as good, but I almost guarantee that it'll work on an actual piano. Thanks for going so in depth with your criticism, it's really very helpful. I'm not all that experienced with this formatting stuff so I pretty much made every change you suggested and I've updated the files in question. I'll try to think about this stuff more carefully in future. Edit: Also I have the full version of finale so I should be able to do everything that's possible. Okay, this one was relatively easier to work than Safeguard. You've played with legos, right? Have you seen those really big ones that are made for toddlers? There's a point to this I promise. Well, think about how much more cumbersome it was going from the bigger legos to the smaller ones. The smaller ones are much more intricate and allowed for a much more detail. This is kinda how the default size presets are in Finale are. It's bulky, kinda just taking up a lot of room which, to me, is really not good for anything. The resize tool is good for eliminating about 60% to 75% of the work needed to move things around, and give you that much more room to do so. I find a resize of 72% to 80% works good for NSM's purposes. And, be reassured that it won't be too small. It's going to be mostly kids who are looking at our sheets. Older cats are just going to have to deal. Anyways, this gives you liberty to move staves if articulations, hairpins, notes, etc., are colliding into one another. 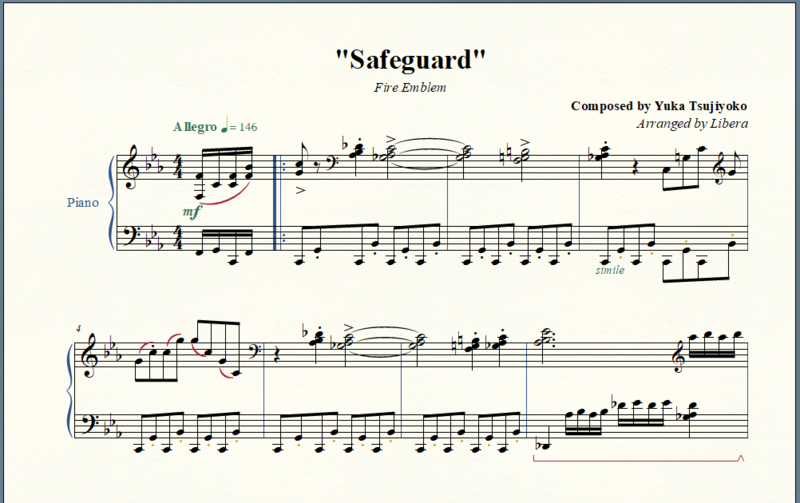 It's a pretty good safeguard (heh) when you have that tail end system taking up one whole page. Okay, so I talked about size, but what about phrasing. You said before that you use slurs mostly for "phrasing." While that's not entirely incorrect, the way it looks on the page is absolutely atrocious. Unless you were to manipulate the handles to basically make them flat above a given stave, I feel it visually loses it's reason for being there. 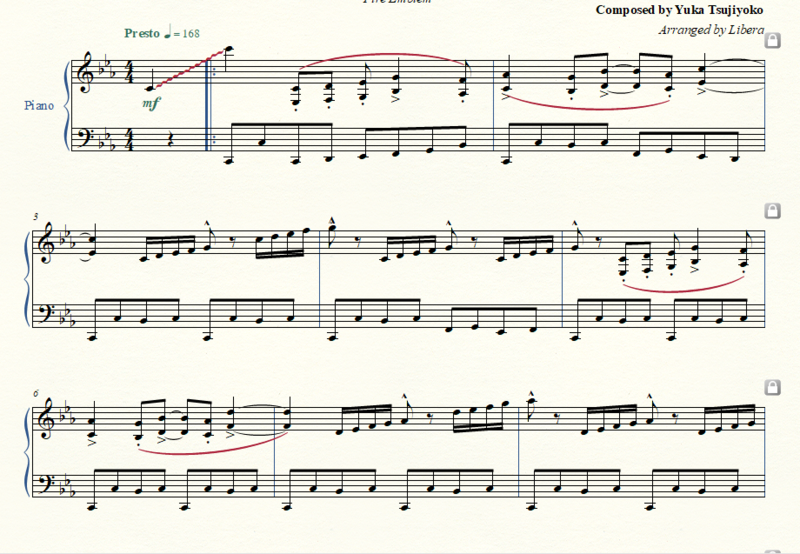 So my solution is to shorten them, and make "macro-phrases" out of the one big phrase like I did in measures 1 - 2, 5 - 6. As for the slurs in 9 to the end, I felt that they served no real purpose. 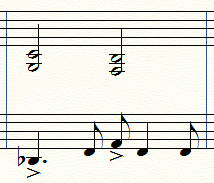 In m. 9 - 18, you have some syncopation happening there which doesn't really warrant a slur over it. Maybe some hairpins, but definitely not slurs. In measures 3 - 4, and 7 - 8, you use an articulation that I wasn't familiar with. The little triangle buddy at the end of the 16th note figure, a Spiccato. I guess the reason I'm not familiar is because I'm not looking at older string scores that warrant a specific bowing articulation, which is what it is. Visually, it's not too annoying or serves a decent purpose if the player knows what that is. However, a more common articulation that communicates what I think you're thinking is the Marcato. Wikipedia says: play the note somewhat louder and more forcefully than a note with a regular accent mark. How I learned to interpret the marcato is by combining an accent with a staccato, essentially. The main point is that it's a more common articulation that communicates pretty much the same thing as a spiccato. I dunno, use your best judgement on that one. The last thing is minimal stuff. Getting rid of the two layers in measure 3 and 7; Connecting the eighth notes in beat one and two in measure 9; Adding some space for release between the the dotted-dotted half note and eighth note and sets up the syncopated figure in the next measure; and disconnecting the eighth notes in measure 16 because they're offbeats. I think that's about it. The rest is just moving staves and barlines around to make it more pleasing to look at. Once again, thanks for going to the effort of critiquing these sheets. I hadn't ever used the resize tool before, but I can see now that's it's pretty useful. I've pretty much made all the changes you suggested. The only thing I've kept are the 'little triangle buddies'. I've never heard of spicatos before either but, as Zeila said above, these are staccatissimos and I feel they covey what I want pretty well. I've updated the files. Thanks again! Spiccatos and staccatissimos are pretty much the same thing. Keeping them as such doesn't hurt the arrangement too much to be honest. You'll find once you start getting the hang of formatting like a copyist is that it's much up to interpretation. Much like with anything else with music. The only thing is that you keep in mind, "does this work visually and mechanically?" and "Is this the simplest and easiest way to communicate what I'm trying to say?" Once you get those two ideas down, you'll find a lot of work a breeze, and a lot of your choices coming down to sonic details. Which is nice. Keep on with it, man. Speaking of keeping on with it, here is a new sheet. I found this one a bit trickier than the last few (it's also a little longer) but it's a really great piece so I'm glad I did it. 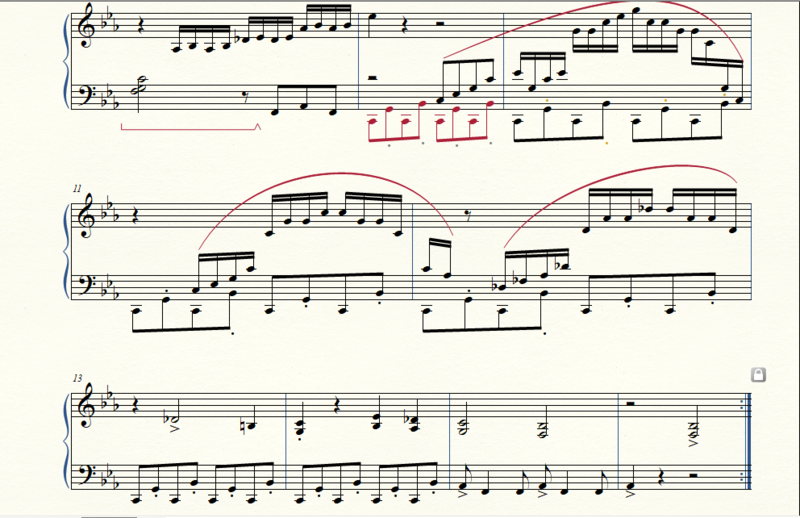 There are some bits that sound odd on finale but when I play them on the piano they sound fine, so (shrug). 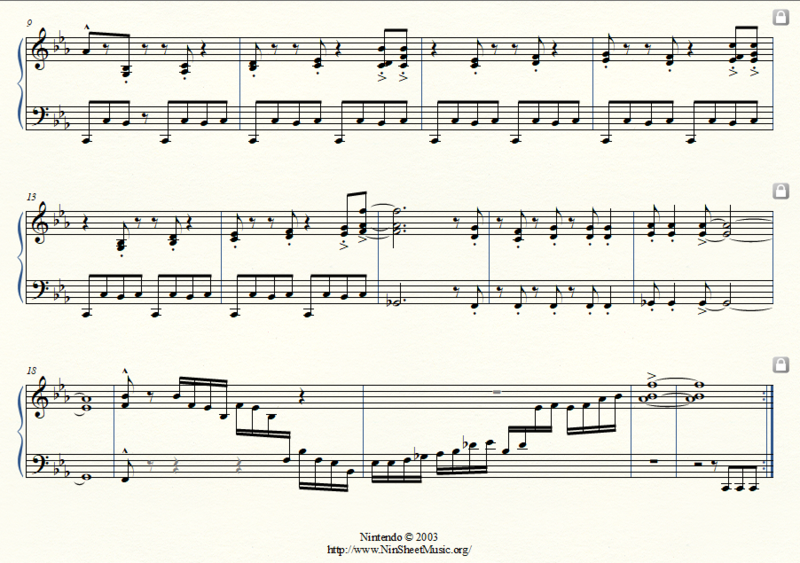 Also there are some funny chords so some of the inner notes might not be entirely 100%. Thanks again for the feedback and taking the time to look these over: it really is helpful having people like you around! I have another suggestion: perhaps you could update the name of the OP to match your most current song? That way, we see what your latest song is, and may gain more interest in offering feedback if it's something we're familiar with. That's a good idea and I hadn't thought about that. Thanks! A whole 11 days without a new sheet... truly terrible... But to compensate here are two sheets! And also we have my first sheet not from Fire Emblem. (woo?) Instead it's from Bravely Default. Disclaimer: neither of these are the 'pretty cool' thing I mentioned earlier. That's still coming, hopefully sooner rather than later. Edit: I'll probably do the vocalised version of Baby Bird as well at some point, but it will probably be a proper vocal + piano arrangement so it won't be in this thread.